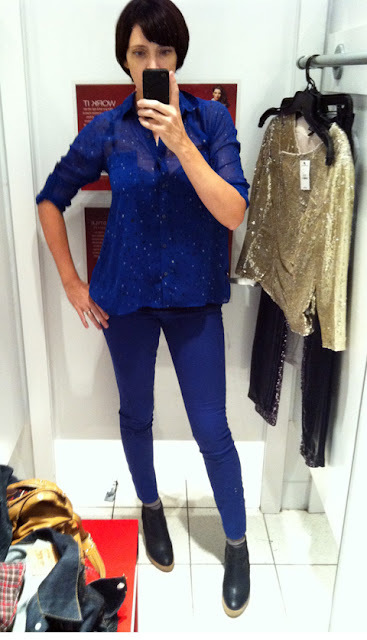 I had to try on the colored jeans at Express after seeing the red ones, but it was the blues that really caught my eye. And while at Express Manhattan Mall last week, I had to try on a myriad of other pants, as they were having a buy one get one for 50% off sale. And then I kept spotting shiny things, and soon I was carrying an armful into the dressing room. Super sparkly legs = super need. $98. 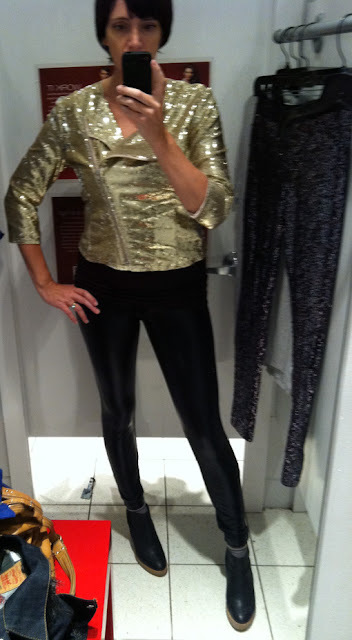 Disco Mama jacket with liquid leggings. Jacket is $128. The blue look I first posted here. Anyone else feeling this way about Express these days? I keep grabbing, and grabbing, and liking what I'm seeing in the mirror. ALL amazing, but naturally I'm loving the cobalt look best! They're not on my list of regular shopping stops, but some of my closet staples hail from Express. The cobalt is so rich and perfect, I love it! That cobalt is much gorgeous & look so nice from another.